Can the World Kick its Car Addiction? Unless we want to drown in congestion and pollution, there is no other choice. This will require enormous amounts of investment. Road transport's future is a tale of two cities. One is typified by Los Angeles, where residents spend four full days a year stuck in traffic and inhaling its fumes. While 80 percent of all journeys there are by car, consider the contrary case of Copenhagen. There, almost 60 percent of all trips don't even involve a motor; they are on bike or foot. In Denmark's capitol, compared to LA, roads are more easily travelled, air is cleaner and life is generally sweeter. Ok, maybe that last point is exaggerated, but the truth is that these cities exemplify a choice: whether or not the car should be our main mode of transport. Most challenged by this question are China and India. With one-third of the earth's people and nearly one-third of global new-car sales, these developing giants must make major changes to avoid becoming smothered and paralysed by automobiles. In developed countries the danger is less acute but still real; it also is where signs of hope and change can sometimes be seen. Probably the biggest reason for change is not the carrot of clean Copenhagen, but the stick of snarling traffic in Shanghai, Mumbai and other developing megacities. Beijing bears the dubious honour of hosting the world's largest traffic jam – a 2010 snafu that snaked 100-km to its northwest. As cars were stuck literally for days, hundreds of police were called out to cool the heads of overheated motorists, while even more street vendors swarmed in to sell them overpriced food and drink. Although normal tie-ups don't trigger such extraordinary measures, they still are expensive. Road overload – measured as wasted resources and time plus missed opportunities – costs the UK, for instance, some 20 billion GBP every year. In London alone the tab is 2 billion GBP, says a 2014 Credit Suisse report entitled 'Themes in Energy Efficiency'. Adding insult to the injury of gridlock comes pestilential air quality. In China, smoky skies simply cannot be overlooked, and even in areas where it is less obvious, pollution threatens. In 1,000 of earth's 1,500 largest cities, atmospheric concentrations of soot exceed the limits prescribed by the World Health Organisation (WHO). This is unpleasant to breathe, and deadly, say atmospheric scientists, who estimate that smoky skies prematurely kill 100,000s to millions every year. There is a better way. Reducing reliance on cars, declare Credit Suisse analysts Eugene Klerk, Richard Kersley and Ashlee Ramanathan, is the key to a liveable future. And this might be easier than many of us think. One of the lowest-hanging fruits to be picked is journeys of 8 km or less, which account for about two-thirds of all travel. 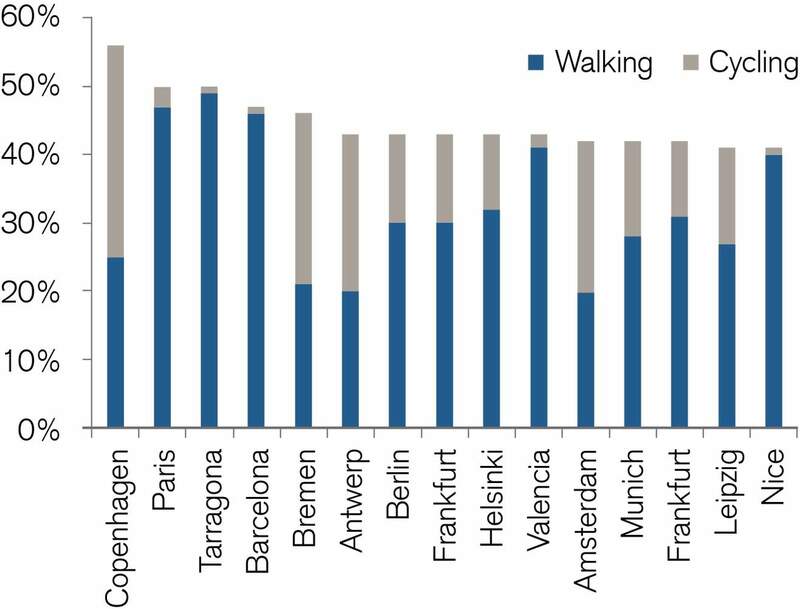 People in not just Copenhagen, but Amsterdam, Antwerp and Bremen already prove that the bulk of these movements can be made using public transport, bikes or legs. Any of those options carry higher numbers of travellers, occupy less space and burn less energy than cars. 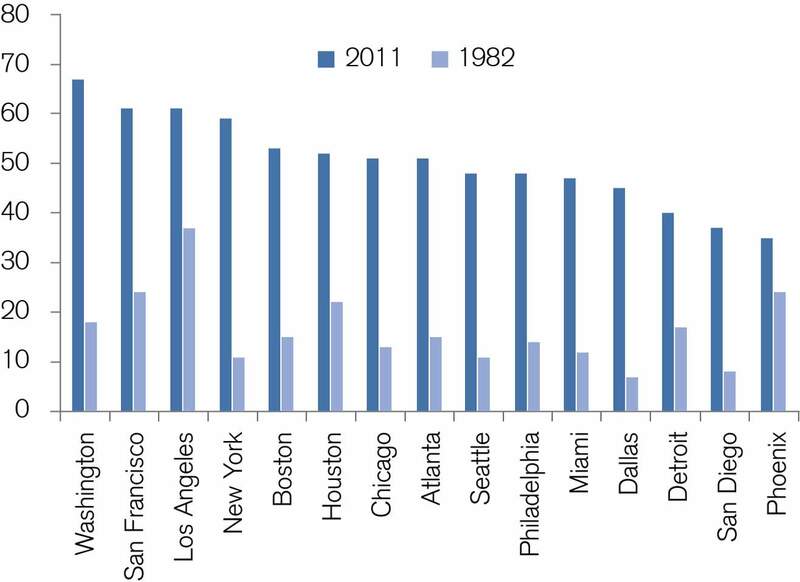 For urbanites, they also cost less. Credit Suisse's Klerk and colleagues proved this in a recent analysis of commuting charges in Beijing, London, New York and Tokyo. In each location, the expense of private transport is substantially greater than public – from 3 x as much in London to 8 x as much in Beijing, with New York and Tokyo about half way in-between. This is no small incentive. Even in the car-happy USA, the world leader with 8 autos for every 10 people, transport costs in urban areas eat up 20-30 percent of an average household's income. Another way to cut congestion is to tap technology. Way back at the 1989 edition of the world's largest trade show, the Hanover Fair, Volkswagen boasted of its ability to steer cars by remote control, to bundle them into space- and fuel-saving convoys that could hurtle down motorways in formation at top speeds, as well as autopilot their way down ordinary byways. Now, a quarter-century later, such systems seem to be on the brink of going commercial, thanks to VW subsidiary Audi, other automakers as well as the ubiquitous Google. The latter notes that autopiloting not only cuts traffic, it also boosts safety. With most of the world's 1.2 million annual road deaths caused by human error, it's almost cliché to say that humans shouldn't worry about driverless cars – but the other way around. Meanwhile, parking is getting a makeover, too. No wonder, given that finding a spot to stow ones wheels causes about one-third of all local congestion. New apps such as ParkMe, BestParking and JustPark can cut hunting time – which in New York and London average 15-20 minutes – down by half. Improvements such as these will ease the car crunch, but not enough to wean us truly off of them. To clear the streets and the air, governments will have to take the lead. The most important measures, say Klerk and colleagues, are regulations for energy efficiency and emissions controls, for which governments will only continue to tighten the screws. Less effective, they say, will be alternative fuels. Contrary to the view popular only five years ago, electric cars are no longer expected to become prominent by 2020, if ever. Powering engines with plant-based ethanol, biodiesel or unconventional fossil fuels might deliver lower emissions, but only at the margins. The other regulatory push will be to force people out of their cars and onto the bus, train, tram or bicycle. It's a tall order, but winds of change are whispering. In both the USA and the UK, significantly fewer people aged 16-30 have driving licenses than those of the same age 25 years ago. Maybe, just maybe, they are less car-happy than their predecessors. Despite many uncertainties, one thing is clear: transport will need a bundle of funding. Even with all the above measures, Credit Suisse still projects the global fleet to double by 2035. Then there is infrastructure: creating a 'developed world' road network in China, for instance, will quadruple the size of its current one to 16-17 million km. All this calls for spending well into the tens of trillions USD. (The USA domestic economy now turns over 17 trillion USD.) A substantial amount of that will flow into non-profit ventures, but nowhere near all. Klerk and colleagues are convinced that out of all the change will come a tale of two types of companies: winners and losers. Is active Can the World Kick its Car Addiction?